After seven and a half wonderful years at AppNexus / Xandr (which was the best home and family I ever could have asked for) I’ve made the exciting decision to join the TripleLift team as SVP, Product. Official coverage here from MediaPost. TripleLift got its start as the leading programmatic native advertising platform (think – advertising that is integrated seamlessly into webpages – not banner ads), but is quickly emerging as a leader in the native category and investing in adjacent areas. Why did I decide to join the TripleLift Team? There are 5 key reasons why I think TripleLift is the next breakout star in ad tech. 1) Native ads are better for advertisers, publishers, users, and the internet. Some ad tech insiders have grown skeptical of native advertising due to “content recommendation widget” companies showing predominately low quality “native” ads tacked onto the bottom of websites. However, TripleLift is different. TripleLift’s core business facilitates real in-feed native advertising that is integrated seamlessly into the content of a website (similar to Facebook in-feed ads). These native ads perform better for advertisers, generate more revenue for publishers, and provide a better user experience than standard banner ads. It’s no wonder that native advertising (and particularly native in-feed advertising) is one of the fastest growing segments of the advertising market. Because native advertising involves serving ads into odd shape ad slots with mis-matched creative assets – TripleLift has become expert at Computer Vision and image scanning technology to accurately crop, resize, and render native ads programmatically. This technology extends naturally into new verticals like OTT, messaging, VR/AR, social platforms, and more, where TripleLift is making major investments. Also, since TripleLift always renders its native ads (rather than serving a 3rd party tag), it’s immune to a lot of the malware, ad stuffing, and poor-quality ad problems that plague other ad tech companies. TripleLift has achieved scale, is growing quickly, hiring, profitable, and, having only raised $16M, relatively bootstrapped compared to a lot of its ad tech peers. As an employment brand, it’s one of the brightest spots in a quickly maturing industry. The founders of TripleLift are 3 ex-AppNexus employees (and my former colleagues). AppNexus has become synonymous with excellent technology and the TripleLift leadership team has maintained that tech-first mindset. TripleLift has successfully launched and commercialized a branded content product (Content Dial) that makes branded content easy to scale for brands and publishers through an automated marketplace. This “non-ad tech” line of business helps diversity the company into new markets. For these reasons I’m thrilled to make TripleLift my next home and I look forward to an exciting adventure in this next chapter. Back in 2017, with the development of their Amazon Basics Batteries and Baby Wipes, some analysts concluded that Amazon was destined to take over the world. Baby wipes and batteries were the first product categories they chose, but there was nothing to stop them from discounting their way into new categories. See below for an excerpt from Kleiner Perkins 2017 Internet Trends report. Having two children under the age of two, the baby wipes analysis struck a chord with me. Starting with the birth of our first son in 2016, we became regular customers of Amazon’s private label baby wipes. At the time, Amazon was the obvious choice. They offered baby wipes for $0.02 per wipe (and as low as ~$0.01 per wipe if you account for Subscribe and Save and other discounts). 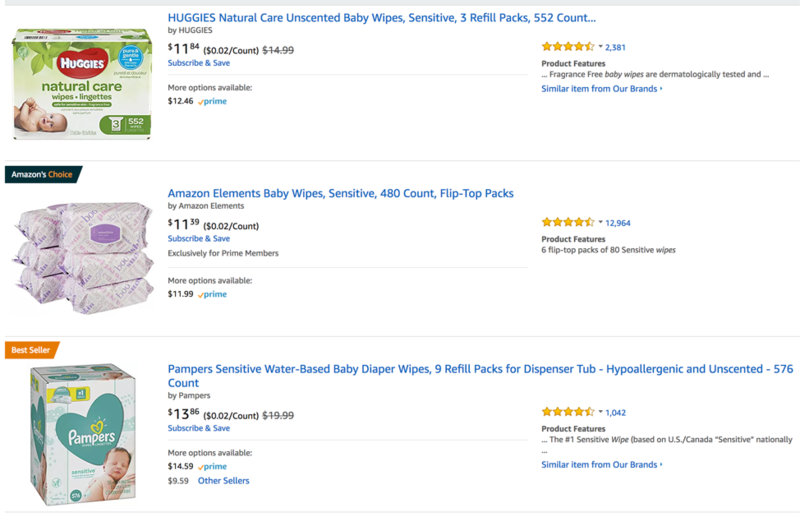 When Amazon introduced their private label product to market, the set of value drivers (things that consumers care about) that defined the baby wipe category was heavily skewed toward cost. 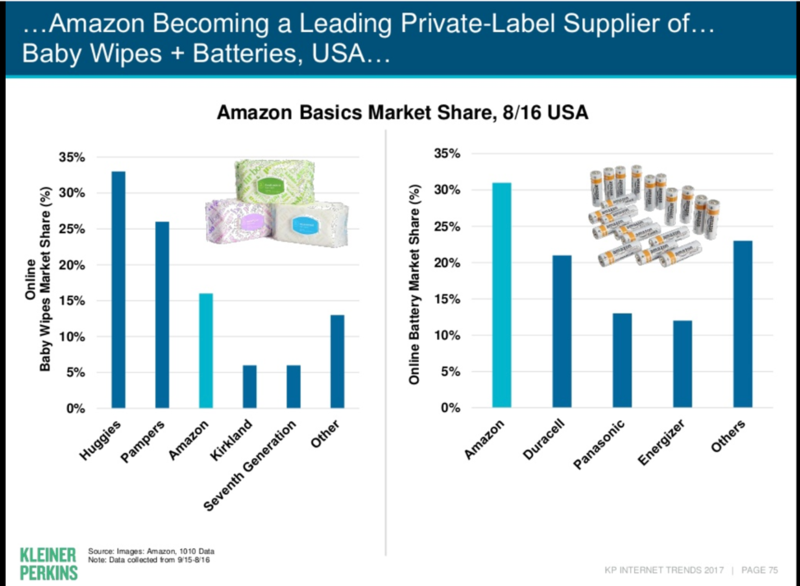 Amazon exploited the fact that baby wipes were a commodity product, drove the price down through the floor, and quickly gained market share. After their market entry, I was sure it was the beginning of the end for some of the pure-play baby brands. Not going down without a fight, Huggies and Pampers both dropped the price of their baby wipes to compete with Amazon. Amazon set the price for the market at $0.02/wipe and everyone else was forced to match. Those of you who know me, or those of you who have been curious enough to click on the “Jewelry Portfolio” button in the upper right of this website, know that I’m a hobbyist metalsmith. I studied metalsmithing in college and make about 10-15 pieces per year – mostly rings, either wedding rings for friends or presents for my wife. I order my materials (silver, gold, platinum, etc.) from a metals distributor (effectively a metals mill) and make the pieces by hand in studio we have in the basement of our house. The mill I work with supplies many larger jewelry stores and last week they sent me a solicitation to sell their pre-made jewelry. According to the solicitation, I would pay them about $10,000 upfront, and they would send me 12 rings that I could re-sell to my customers for $50,000, turning a $40,000 profit. Their economic proposition was solid, but I could not have been more offended. I am a jeweler! I make all of my jewelry by hand; I’m not going to re-sell some mass-produced stuff, that’s not why I got into jewelry in the first place! The more I thought about the solicitation, the more I wondered how many jewelers ended up taking the deal and sacrificing their craft for the sake of making a better profit. In order to understand that, we need to talk a little bit about the process of making jewelry. There are many different ways to make jewelry and they each involve slightly different division of labor between the jeweler and the mill – and as a result, a different level of “handmade-ness”. My favorite way to make a ring, and by far the most “pure” in terms of being handmade, is by ordering casting grain (effectively small metal balls) from the mill, melting them down into an ingot mold, and then hammering, cutting, drawing, and soldering the metal into the desired shape. Ordering casting grain is also the most cost-effective way to order metal because it involves the least amount of processing at the mill. 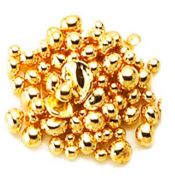 To give you an idea of the cost, five pennyweights (abbreviated “dwt”; about 5/18ths of an oz) of 14 karat yellow gold (just about what you’d need to make an average size ring) costs about $210. Of that $210, $197 is the raw cost of the gold based on fluctuating metal markets, and $13 is the fee paid to the mill for creating the product. That’s about a 6% fee – which is pretty good! At higher volumes the fee is even lower (as low as 1% once you get to ~$10,000 or above in order volume). However, the part that’s not so good is the amount of labor involved in melting, forging and craft gold from scratch. It takes me about 10 hours of work to make one ring using this method. Needless to say, the business doesn’t scale too well if I can only make one ring per 10-hour day. The next more “pure” way to make a ring is by ordering what’s called “sizing wire” from the mill. Sizing wire is casting grain that the mill has already melted down and drawn into the dimensions you want. It comes in the form of a long wire – all you have to do is cut and form it. If I was to order sizing wire to make the exact same ring as we contemplated in Method 1 above, it would cost about $216 for the materials. The mill charges an extra $6 for creating the wire. That brings the total fee to $19 or about 9% of the $216 total cost. Yes – on a percentage basis, this is an increased fee (9% for the wire vs. 6% for casting grain), but it’s only $6 more and starting with the pre-made sizing wire vs. melting the gold yourself saves about two hours of labor. If you’re looking to start a business, this is a no brainer. $6 for two hours is an easy trade. Because of the time savings I end up ordering a lot of sizing wire and still feel pretty good about still calling my work “handmade” – after all, I did all the work of cutting, sizing, finishing, and setting stones and it still takes a really long time. (Ring: 1ct Sapphire set in 14kt Yellow Gold). It took me about 8 hours to make this ring from start to finish. 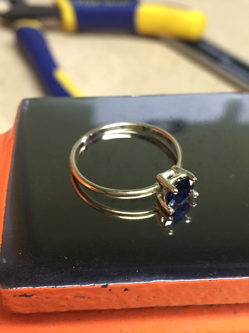 By far the most labor intense part of making the Sapphire ring above was hand-crafting the setting for the stone (the wire prongs that hold the stone in place). Each prong of the basket setting had to be soldered independently and carefully as to not disrupt the position of the other prongs. The size of the setting also had to match the size of the stone perfectly, or else the stone wouldn’t fit correctly. The setting alone took about four hours to make (half the time of the total ring). For about $30 ($22 material/$8 fee) I could have ordered a pre-fabricated stone setting for this ring. The fee on the pre-fab setting is pretty hefty at 27% – but hell, it would have saved me four hours of work and it’s only an extra $8. A lot of jewelers probably see this as an easy trade as well. Well – now that I’m ordered the pre-fab stone setting, what about the ring “shank” (the part that goes around your finger)? 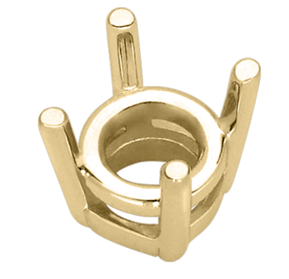 As it turns out, I can also order a pre-fabricated shank that fits this setting perfectly for about $225 ($194 materials/$31 = 14% fee). The total I would have to pay for the pre-fabricated shank and setting would be $225 + $30 = $255. When ordering a pre-fabricated shank and setting – there is only one soldering step to create the ring (just attach the setting to the shank and you’re good to go) – that would probably only take about two hours of work total to get to a finished ring (down from 10 hours of work in method 1). That’s eight hours of time savings for an incremental fee of 17% pts. My guess is a lot of jewelers (probably most), order pre-fabricated shanks and settings and enjoy the time savings associated with Method 3 (after all, if you think about it, using Method 1 basically means you’re paying yourself less than $6 per hour to fabricate the components of the ring). But let’s go back to that email from the start of this post: where the mill wants me to sell their pre-made jewelry. When I started out here I was ordering raw materials from the mill and making handmade jewelry (the mill was solidly my vendor). Slowly, step by step, as we walk from Method 1 to Method 3, you can see how the mill lures jewelers to progressively easier methods for making jewelry – each step providing additional positive economics – until the jeweler is using Method 3, just a hop skip and a jump away from re-selling finished mass-produced jewelry. The part of this I found most interesting was my emotional reaction to the proposition from the mill. I pride myself on making jewelry by hand, but at some point, between Method 1 and re-selling mass produced jewelry the “handmade” badge is lost. Is it lost at Method 2? Method 3? By blurring the line of what really is handmade and providing positive economics along the way, the mill has perfected their program of turning their customers into their re-sellers. The really sad part of the story is when a jeweler starts re-selling mass produced jewelry – do their customers even notice the difference? I found this whole system to be fascinating and applicable to lots of other businesses. I hope you enjoyed it too. When I was in 4th or 5th grade, I went on a summer hiking trip up in the Adirondack mountains. It was a three-day trip with about 15 kids. At night we camped out in tents along the trail. Overall, I recall the experience fondly and the trip started off great. The first day was bright and sunny. I was one of more the more athletic kids, so along with a few others, I set a pretty aggressive pace for the hike. We were way out front ahead of the pack. I remember what it felt like to be out front – it felt good. It felt like we were winning. We could stop to explore different areas at will, we could leisurely enjoy views of the mountains, we were in complete control. Day two was a bit different. Back in 2015, I was introduced to Jonah Goodhart, CEO of MOAT. Jonah is a well-known ad-tech leader with many exits to his name (you can read more about Jonah here) but, at the time, I knew him primarily as an early investor and board member of Right Media. Jonah is a nice guy and even today (three years later) I remember having a positive conversation with him. However, what really stuck in my head is what happened after we finished the stated agenda of our call. Jonah said (more or less) – “while I have you on the phone, let me show you our product” – in an instant, before I could even ask why, he had a screen share up with about 20 pre-loaded browser tabs open. He then launched into a comprehensive product demo covering every aspect of the MOAT viewability product. The demo was flawless – like he had practiced it a thousand times. I remember walking away from the call a little puzzled. Why did Jonah Goodhart just spend an extra 20 mins on the phone with me to deliver a product demo? With full hearts we welcomed our second son Graham into the world this past week. He’s doing beautifully, as is his mother, and his older brother Jack is handling the transition with class. When we came home from the hospital mid-week we realized that we are now in the prestigious “two under two” club, meaning we have two children under two years old. Prior to having Graham, I talked to a lot of friends about what to expect as the parent of two children and many of them used the same analogy to describe it. “It’s like ‘one on one’ defense”. Most of them joked that going from two children to three children was the real challenge “then you had to switch to ‘zone defense’”. Levity aside, as someone who played men’s lacrosse for most of my youth, it feels a lot more like ‘man down’ defense. The only time when ‘one on one’ dynamics are really possible is when both parents are directing 100% of their attention toward caretaking. If either parent wants to do anything independently (or god forbid use the bathroom or take a shower) it puts the household into an immediate shorthanded formation where one parent is covering two children. We’re only one week in, but so far so good. I think the best part so far has been watching the two boys interact. Watching two children that you created interact is really quite magical. Last Thursday, Build-A-Bear workshop announced that they would allow customers to “pay their age” for their products. For those not familiar, Build-A-Bear workshop sells customizable teddy bears and other stuffed animals for – after customizations – roughly $50-$60, so it’s no wonder that the “pay your age” event garnered a lot of interest. Around the country parents of young children salivated over the opportunity to get their youngsters a new stuffed pal at a steeply discounted price. At this point, we all know it was a disaster. So many people showed up for the event, they had to shut it down only a few hours in. And of course – an unfulfilled promise of a new stuffed animal to a young child is a pretty serious problem for a parent. The promotion was billed as “pay your age” – which successfully lodged in the minds of their customers that they would be able to get a fully customized furry companion for their three-year-old child for just $3. Going back over a year I had heard about blockchain – particularly the applications to the digital advertising industry (where I work), but I had never seriously considered investing in any crypto currencies. Also – I wasn’t really sure I understood what a BitCoin was or why it was so valuable – so I took some time, talked to a few people, and really tried to understand what was going on under the covers. After a few days of research, I could confidently say I think I understood it. I work in tech… and after a few days I got to “I think I get it”. However, the more I learned about Bitcoin the more skeptical I became about it’s prospects and all crypto currencies. I also learned that the first text I got: “do you want to invest in Bitcoin?” was actually critical piece of what makes bitcoins so valuable. If you ask most people, they will say that religion and politics are the two things you should never talk about with family or business associates. Those two topics are just too divisive – it’s too risky to even talk about them. Is this really a good cultural norm? Not being able to discuss things with people close to us? It’s true that these issues are divisive, but doesn’t that mean it’s more important to discuss them with people we care about so we can all progress our thinking? No wonder we’re so vulnerable to online political trolls influencing our thinking and polarizing our country – if we have no practice dealing with these conversations in real life, how are we supposed to deal with them online? How many different ways are there to create true long-term value? It’s difficult to even think of how to answer such a question. Hmm.. let’s see, there are lots of different industries to start, so that makes the problem pretty broad. Also, there are lots of different methods to improving a business: you can optimize a current business model, you can disrupt a value chain with a new business model, you can just work harder, you can work smarter, etc. etc. I was thinking about this question over the weekend when an episode of Shark Tank came on the TV. “Perfect!” I thought. Here’s a great case study. The entire premise of Shark Tank is that the “sharks” are gifted business people who create long term value. Let’s take a look at Mark Cuban (he just happened to be the one I picked on). He’s written books, he owns a basketball team, and is overall portrayed as a gifted businessman. Surely he’s someone who has mastered the art of creating long term value, right? But how did Mark make his money? Let’s take a closer look.